Several months ago I watched a show on the Discovery Channel about the Army Special Forces selection process. Oddly enough the show was titled, “Two Weeks in Hell.” Here were men who had already made it through basic training and most had endured Ranger school. But they wanted more. They wanted it so bad they were willing to endure two weeks with little food, days without sleep and excruciating pain with the possibility of severe physical injury just for the chance to enter the training to become a member of the elite Green Berets. Noticed I said a “chance.” There were no guarantees. Only a small number would complete the two weeks and only a small number of those who completed the two weeks would be selected to begin training. On one of the days they were told to march. They had to get to a specific location within a certain time. Sounds easy enough; however, they were not told how far away was the destination nor how much time they had to get there. They just had to march along with their 50 + pound packs not knowing when the end would come. It made me wonder. What would happen if I conducted my life as a follower of Jesus with that much passion, abandonment and discipline? No this blog article is not how Christians should go through military training. But when I compared their dedication and discipline to achieve their goal to my walk with Jesus, I found myself lacking. Here is a group of men who are truly dedicated and passionate about being part of an elite group. They are willing to lay it all on the line up to and including death to achieve their goal. Yet I often struggle to just get up an hour earlier each day to spend some time in prayer. Am I really sold out to being a follower of Jesus, or will I follow just as long as it is convenient and not too much trouble? What would happen if I sought after Jesus with the same amount of passion and discipline? Would I have a more effective ministry? Would I be a better husband and father? The 12 disciples left their way of life behind to follow Jesus without knowing where they would be from one day to the next. They left behind their families, friends, and the security of earning a living. The early Christians sold all (not some, not part, not 10% but ALL) of their possessions and provided for one another. Many of them willingly gave their life. Our society has made us soft. Many people believe and some even teach all you need to say is that you believe in Jesus and you can keep on living your life with your own agenda. Others will tell you that God just wants you to be happy and have an easy life. Is that really the example that Jesus and the early followers set? Yes we are saved by grace. There is nothing we can do to earn salvation or the love of God. He gives it willingly. Salvation is a starting point. God calls us to a life where we sell all. A life where we abandon our own agendas and desires and go ALL IN for Jesus (not some, not part, but ALL). When we do, we will soon discover the joy and peace that we are created to experience. This is how God created us to live. As we give all of ourselves we find all of Him. Yeah life may be hard and even painful at times. But I want to be so close to a God who is madly passionately in love with me that I am completely transformed. I can then live the life that just might change the world. I am in the process of going ALL IN, how about you? I know that this journey will not be easy, but the peace of God will see me through any circumstances. 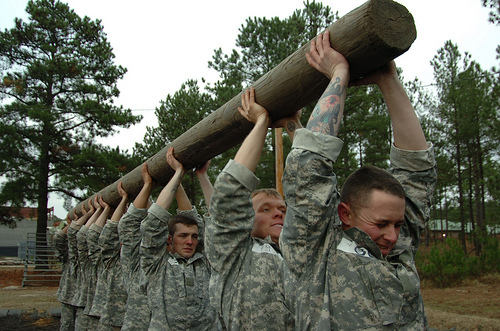 A Green Beret is willing to endure physical pain and torment to be a part of that elite group. They willingly lay their lives on the line so I can live in freedom. Am I willing to pay the same price for Jesus? I pray that I will continue this journey to sell all of who I am and go ALL IN. 1. How do you believe God is calling you to go all in for Him? 2. What changes do you need to make your life to continue on this journey?